For once the expectations are low. The Pittsburgh Penguins won’t be rolling into the CONSOL Energy Center for Game One against the New York Rangers. 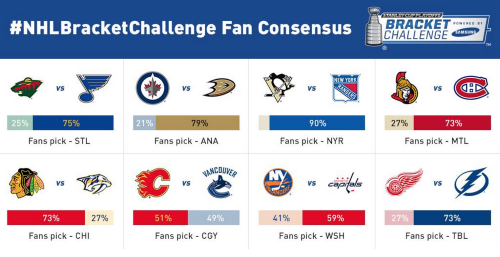 Instead the Penguins are heading to Madison Square Garden to start the series against the Rangers, and almost no one thinks they can pull off the impossible. Make that 90% of “everyone” to be exact. Can you really blame them? Even though the Penguins have the advantage when looking at advanced statistics, they are missing defenseman Kris Letang who played a big part in making them look so good on paper. According to Dejan Kovacevic, Kris Letang will not be rejoining his team on the ice this season. Based on that alone you have to rethink the Penguins going very far. Factor in their 3-5-2 record to finish the season and their run becomes even shorter. Finish it off with only 11 goals in their last six games and you have begin to wonder if they can win a game. Like I said, expectations are low. Low enough to start wishing. Wish to drive Henrik Lundqvist insane. The Pittsburgh Penguins’ new pack mentality, courtesy of Head Coach Mike Johnston, has them going hard to the net. No one has been doing a better job of it than Patric Hornqvist. He has 25 goals to show for it. He’s not afraid to go straight to the blue paint and take a beating without taking a penalty. Now imagine if Chris Kunitz can do the same. Imagine if Sidney Crosby is stationed at the goal line on the powerplay. Imagine if the defensemen can get the puck through and all three of them can clean up the trash over and over again. The New York Rangers have quite the group on defense. If the Penguins can get the puck by them, all they have to do is try and jam the puck past Lundqvist over and over again. Wish for the legs to feed the wolf. It’s no secret that the Penguins looked very slow down the stretch. Playing with five defensemen will do that to a team. Christian Ehrhoff and Derrick Pouliot will hopefully return sooner than later. Until then, the Penguins called up Scott Harrington and Brian Dumoulin from the Wilkes-Barre/Scranton Penguins. Both have already had some NHL time with the Penguins earlier in the season – Dumoulin going as far as to score his first NHL goal. While they may not have the same NHL experience as those around them, let alone in the playoffs, they do have young fresh legs. If nothing else, they can skate and get the puck up to the forwards who need it. Something as simple as that is missed with Kris Letang out of the lineup. If Harrington and Dumoulin can get back to basics the team will benefit immensely. Wish for this team to be a team. No more neck checks to Sidney Crosby. No more emotional meltdowns. No more implosions. This team played like a team to start this season. Hopefully they can start the playoffs the same way. Hopefully Steve Downie can walk the fine line between drawing and taking a penalty. Hopefully Maxim Lapierre use his is post-season antics in the Penguins’ favor. Hopefully they’ll stick together regardless of the result. Wish for the stars to shine. The Penguins need Sidney Crosby to rise to the occasion. They need Evgeni Malkin to work his magic on the big stage. They need Marc-Andre Fleury to steal the show. This isn’t optional. This is a requirement. Admit it. You’re happy the Penguins are even able to attend the dance at all. You’re going to tune in. You’re going to cheer. You’re going to get into it. No matter how much you scoff at the idea of these Penguins even having a chance, you’re secretly wishing for a miracle. If they steal one game, who’s to stop them from stealing another? Save that wish for later.